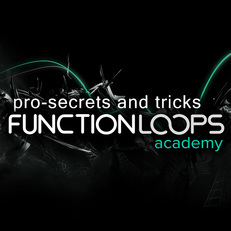 Pro Secrets and Tricks from Function Loops Academy delivers in-depth electronic music production course about building a track from scratch. Covering every part of the process: Kick, Percussion, Bass, Chords, Melody, Pluck and most important - final Mix. You will learn about everything: EQ, Reverb, Delay, Compression, Sidechain, Sound Design, Grooves & Rhythms, Music Theory, Notes & Keys, Virtual Instruments, various Effects and a bunch of tricks and pro-tips, that every producer needs to know. That's the difference between successful producers and the ones who struggle. This course will take you to a different level, guaranteed. The course is downloadable instantly, after purchase. We tried to cover the most ground in these videos to give you basic knowledge, but also some very in-depth, advance tips and tricks, that you must absolutely know, if you want to produce electronic music. We hope you enjoy the course. You can send us comments and your music for review, we might give some tips and help you further in your path.